With over 100 combined years of audio measurement experience, our team has created a wealth of technical papers, sequences, articles and other useful information to assist you with your audio test needs. Please browse the collection below, or filter by type of resource. This test sequence demonstrates SoundCheck’s Triggered Record – Chirp Trigger function for open loop testing of devices without analog inputs such as smart speakers, wearables, smart home devices, tablets and cellphones. A stimulus WAV file is created in SoundCheck and transferred to the device under test, where it is played back and the response recorded in SoundCheck as if the stimulus were played directly from SoundCheck. The Acquisition step is triggered by the chirp in the stimulus file. Chirp triggers are more robust than level and frequency triggers which are susceptible to false triggering due to background noise. This sequence characterizes the performance of transducers such as speakers, microspeakers and headphones by measuring how much voltage is required at each frequency to drive the transducer to specified limits of THD, Rub & Buzz, Perceptual Rub & Buzz or Compression. This is useful for detailed transducer analysis and determination of optimal power rating. 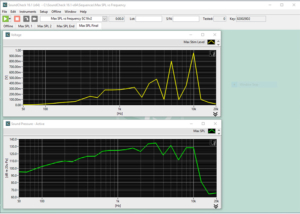 The user selects which metric is tested (one at a time is advised), the limit value and the stimulus start frequency. The sequence then uses an iterative looping process, initially with a +3dB step and then a +0.5dB step to precisely determine the value at which the limit is exceeded. This is repeated across the frequency range to generate curves of voltage and SPL vs frequency at the specified limit. 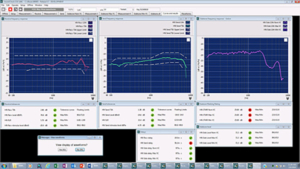 This sequence tests to TIA 920-B, a comprehensive US dual-bandwidth standard that applies to both narrowband (NB) and wideband (WB) devices. 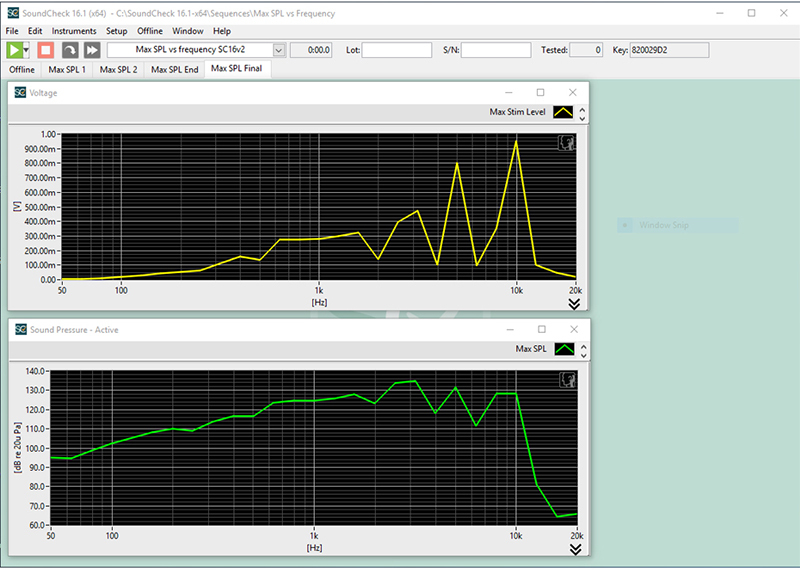 It also allows a choice between Free Field (FF) and Diffuse Field (DF) as the Listener Reference Point (LRP). The current release of this sequence measures digital communications devices with handset features, according to TIA-920.110-B and speakerphones, according to TIA-920.120-B. Support for headset measurements, according to TIA-920.130-B will be added in a future release. This module is a large structured set of sequences and subsequences which perform all the measurements. Curves and values are shown on the screen, tolerance checks are performed, and data is saved to Excel spreadsheet files. Completely prompted sequences for calibration of all the transducers are included. After a one-time setup with a sound card and other user-specific interfaces, the sequences are automatic. They run by simply selecting, pressing start, and following prompts where user interaction with the device under test is required. The sequence works with approved sound cards for connection to the transducers. Windows audio devices such as USB headsets work directly with SoundCheck®. VoIP softphones also work with SoundCheck, by means of a recommended third-party Windows audio application. This sequence allows you to test devices without an analog input such as smart speakers, tablets, cellphones and MP3 players using SoundCheck’s frequency-based trigger functionality. This method offers improved accuracy over previous level-based triggering, especially in noisy environments. A stimulus WAV file is created in SoundCheck, and copied to the device under test, where it is played and the response recorded in SoundCheck as if the stimulus were played directly from SoundCheck. The stimulus WAV file to be used on the device under test (DUT) may be customized in the stimulus step. Note that this sequence uses the level-based trigger available in SoundCheck 16.1 and later. If you are using version 16.0 or earlier, please see the level-based trigger sequence. 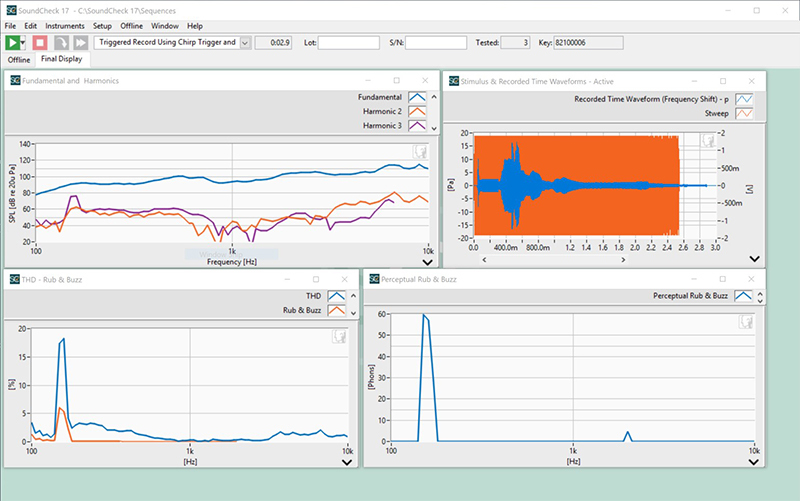 This Background Noise Simulation sequence follows the ETSI ES 202 396-1 standard. 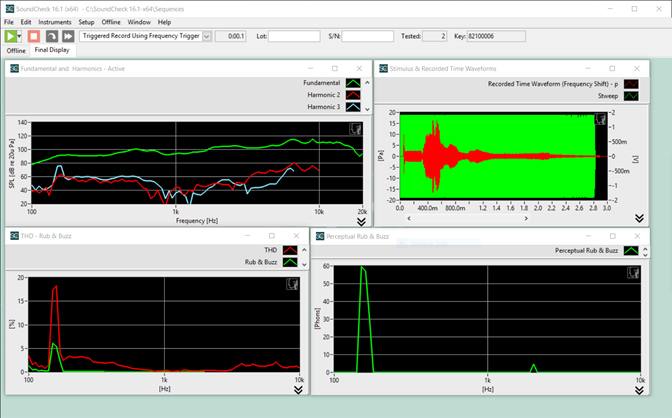 It will automatically calibrate a standardized 4.1 speaker / subwoofer setup in accordance to the ETSI ES 202 396-1 standard “Loudspeaker Setup for Background Noise Simulation” and provide an equalized, calibrated playback solution to stress your device in a standardized and repeatable way. Included with the sequence is a library of real world binaural recordings from the ETSI standard: cafeteria, pub, crossroad, vehicle, single voice distractor, and office noises. Custom or user-defined binaural recordings can also be used to create background noise tests directly applicable to your product. This sequence has many applications including evaluating ANC on headphones, noise suppression on communication devices, voice recognition testing of smart speakers / IoT, SNR optimization of microphones on telepresence devices and beamforming directionality studies of microphone arrays. This sequence allows you to measure a playback system without analog inputs using a 6 microphone array. Specifically, the sequence is designed to measure an in-car audio system. 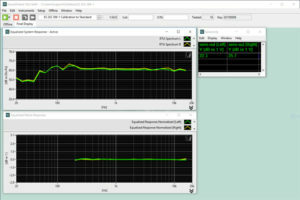 A stimulus WAV file is created in SoundCheck and transferred to the device under test (DUT) where it is played back and the response captured by SoundCheck using a triggered record function. The 6 recordings are batch analyzed to produce individual fundamental curves and the curves are post-processed to produce a single average curve from which an average sensitivity value is calculated. In this paper, a mathematical definition of Total Harmonic Distortion + Noise suitable for testing high-resolution digital audio systems is presented. This formal definition of the “distortion analyzer” mentioned in AES17 defines THD+N as the RMS error of fitting a sinusoid to a noisy and distorted sequence of measurements. We present the key theoretical result that under realistic conditions a modern THD+N analyzer is well-described by a Normal probability distribution with a simple relationship between relative error and analysis dwell time. These findings are illustrated by comparing the output of a commercial distortion analyzer to our proposed method using Monte Carlo simulations of noisy signal channels. We will demonstrate that the bias of a well-designed distortion analyzer is negligible. Authors: Alfred B. Roney The Mathworks, Inc. (formerly Listen, Inc.) Steve Temme, Listen, Inc. Presented at AES 2018, New York, NY. In order to minimize costly warranty repairs, loudspeaker OEMS impose tight specifications and a “total quality” requirement on their part suppliers. At the same time, they also require low prices. This makes it important for driver manufacturers and contract manufacturers to work with their OEM customers to define reasonable specifications and tolerances. They must understand both how the loudspeaker OEMS are testing as part of their incoming QC and also how to implement their own end-of-line measurements to ensure correlation between the two. Authors: Steve Temme, Listen, Inc. and Viktor Dobos, Harman/Becker Automotive Systems Kft.